Thomas Wesley "Tommy" Miller, 39, of Moss Point, MS, passed away on Friday, July 27, 2018 in Ocean Springs, MS. Tommy was born on September 17, 1978 in Pascagoula, MS. 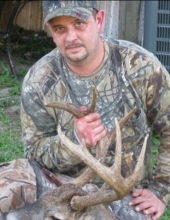 He was an avid lover of fishing and hunting. He had a big heart, and he loved his children unconditionally. He always had the backs of the ones he loved. Tommy was preceded in death by his grandparents, J.W. and Norma Jean Jordan and Charles Ray and Betty Miller. He was survived by his wife, Caroline Thweatt Miller; parents, Alisha Ann Evans and Billy O'Bannon; children, Anna Golemon, Wesley Reece Miller, Allie Elizabeth Miller, Trevor Slater, and Taylor Clarke; siblings, Candice (Jason) Gasaway and Jordan (Meagan) Evans; nine nieces and nephews; very special friend, James Stewart; along with numerous aunts, uncles, cousins, and friends. Tommy was very excited about his first grandson that is soon to arrive. The visitation for Tommy will be held on Friday, August 3, 2018 from 2:00 p.m. until 3:00 p.m. at Heritage Funeral Home in Escatawpa, MS. The funeral service will follow in the funeral home chapel beginning at 3:00 p.m. with Bro. Alton Stokes officiating. Honorary pallbearers will be Garet Harrington, Gage Harrington, Reece Miller, Jason Gasaway, J.J. Gasaway, Jordan Luke Evans, and Trevor Slater. Gone but not forgotten. He is fishing and hunting in Heaven. To send flowers or a remembrance gift to the family of Thomas "Tommy" Wesley Miller, please visit our Tribute Store. "Email Address" would like to share the life celebration of Thomas "Tommy" Wesley Miller. Click on the "link" to go to share a favorite memory or leave a condolence message for the family.